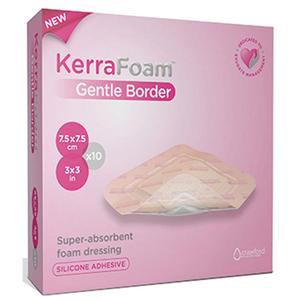 KerraFoam™ Absorbent Dressing gentle border and foam pad absorbs and locks in exudate. It also has excellent fluid retention capabilities. Instantly locking harmful excess exudate away from the skin helps to prevent maceration and wound edge breakdown. It adheres well to awkward areas without limiting movement. It is designed for protection and exuding wounds, secured with a gentle silicone contact layer. Lateral wicking technology increases capacity and wear-time, and a soft silicone adhesive contact layer helps to prevent painful dressing changes and skin stripping, making this dressing ideal for both wound care and skin protection. Outer polyurethane film layer: A smooth, water-resistant and bacterial barrier, helping to create a moist protective healing environment. Soft and non-woven material: Helps to provide comfort for the patient. Absorbent core and foam pad: Combined to both absorb and lock-in exudate, even under compression. Unique horizontal wicking layer: Efficiently distributes exudate, reducing the risk of maceration. It increases capacity for absorption. Helps reduce the number of dressing changes. Helps to prevent strikethrough. Gentle and silicone adhesive wound contact layer: Secures the dressing in position. It helps to ensure less pain at dressing change for the patient. It will adhere to intact skin, but not the wound bed.